What's that stuff in the background falling from the sky behind new Giants LT Nate Solder? NFL free agency is now essentially a week old, and teams around the league have revealed what their strategies were. While some additional minor moves are likely to be made, now feels like an appropriate time to take a look around the rest of the NFC East and grade each of their teams' free agency period. We'll start with the 3-13 Giants. 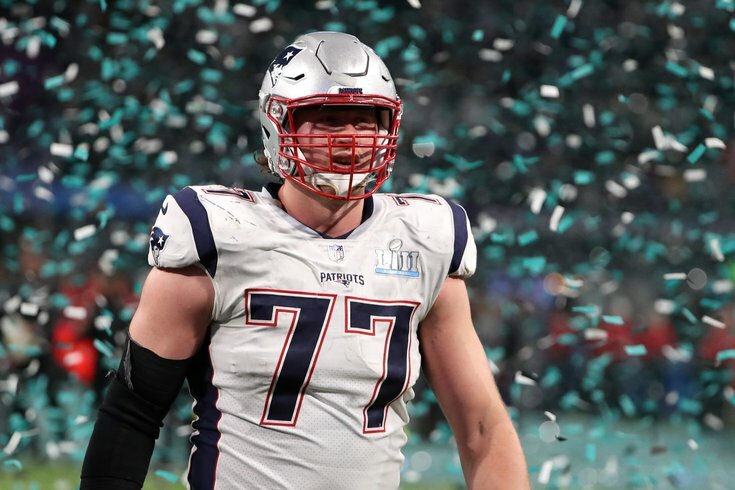 The Giants signed OT Nate Solder away from the Patriots on a four-year, $62 million deal that makes him the highest-paid offensive lineman in the NFL. The Giants signed OG Patrick Omameh away from the Jacksonville Jaguars on a three-year deal worth $15 million. The Giants felt comfortable letting Richburg walk on the premise that they believe in backup center Brett Jones. The Giants obviously felt like Richburg wasn't worth the five-year, $47.5 million contract he received to play for the 49ers. I don't disagree, as that is an asinine contract. Still, going from Richburg to Jones is a downgrade. First, the Giants added Solder, who as noted above, is now the highest-paid offensive lineman in the NFL. Unfortunately for the Giants, he is, at best, the fifth-best offensive tackle in the NFC East. Making Solder the highest-paid offensive lineman in the NFL was a ridiculous overpay, which the Giants have to recognize. However, considering how awful their line was in 2017, particularly with Ereck Flowers at left tackle, they clearly felt like adding a competent left tackle was worth the price of not having to worry about some RDE wrecking the game from week to week. Flowers will likely move from left tackle to right tackle, which is easier said then done, as many defenses now put their best pass rusher up against the RT. To fill the hole vacated at LG by the departure of Pugh, the Giants signed Patrick Omameh, a journeyman guard who is now on his fifth team in six years. Omameh was a fallback option after losing out to the Jacksonville Jaguars for Andrew Norwell. Like Solder, Omameh is being overpaid on a three-year deal worth $15 million. The Giants spent a hell of a lot of money on their offensive line, and I'm not sure they even got any better. The LT spot is clearly an improvement, while the Giants downgraded at LG and C. Bobby Hart was a bad RT, and Flowers should be an improvement there, but we'll see. Expect growing pains in 2018, as their OL has no continuity whatsoever. Onto the odd move of adding RB Jonathan Stewart on a two-year deal worth $6.9 million. Giants GM Dave Gettleman and offensive coordinator Mike Shula have familiarity with Stewart from their time together in Carolina, which is fine, except that Stewart looked cooked last season. Stewart will turn 31 on Wednesday. He has high mileage (1800 career carries), and his yards per carry have fallen in each of the last three years, most recently with a 3.4 yards per carry effort in 2017. Take Stewart’s rushes out of the equation and the Panthers averaged 4.9 yards per carry in 2017. He is the type of player you sign two weeks into free agency, not during the legal tampering period. Apparently, the Giants wanted to add Stewart to the locker room because they hope his good work ethic will become contagious. It doesn't really work that way. Young players respect and emulate good habits from other players when they can still play, not when they aren't good anymore. The Giants are moving from a 4-3 to a 3-4, so it stands to reason that their recent propensity of giving zero f***s about their linebackers was going to change. The Giants are now left with just five picks in the 2018 NFL Draft, one in each of the first five rounds. New defensive coordinator James Bettcher also brought over a familiar face in LB Kareem Martin to play on the edge in the Giants' new defense. Martin has great size at 6'6, 272. The Giants added him on a three-year deal worth $15 million, with a max value of $21 million if he reaches incentives. Martin is light on production (4.5 career sacks in 4 years), but he does possess some upside, and Bettcher obviously knows what he's getting. This is another overpay, but one that makes sense on a young player with some potential. On the outgoing side, LB Devon Kennard, who was the Giants' best linebacker in 2017, bolted for the Lions on a three-year deal worth $17.25 million. One of the problems with drastic scheme changes is that you have to use valuable resources to find players to immediately plug into your new defense, and that's what the Giants were forced to do here. • CB Dominique Rodgers-Cromartie: The Giants made the obvious decision to release DRC and save $6.5 million after he wouldn't agree to a pay cut. The Giants were thinking of moving him to safety, but personally, I didn't see that as a viable option, given DRC's occasional lack of interest in tackling. • P Brad Wing: Wing stunk. This was another fairly obvious move. Improving a 3-13 team shouldn't be that hard. And yet, despite spending a lot of money and resources in free agency, I just don't see that the Giants got much better with the above moves.